I’ve been struggling for a while to come up with a proper name for these robots but I felt it was important to get that settled first. After all, My long term plan is to eventually put these on the market. Munchybots seemed like a good mix between explanatory,curious and cute. It also sums up two of my hobbies: Robots and having the munchies. The Pizza model (Piz-O) was done last year. When I finished that project I was convinced this was something I would want to do more and get better at. Most importantly: I was finally making toys! After that I set out o design a noodle shop. This after watching Blade Runner again. Coincidentally there was also a robot serving a bar in Fallout 4, which I played a lot in December. Witch Piz-O the idea was born that every Munchybot had a food feature that would be impossible for humans to do. Piz-O served pizzas it baked in its own belly. Nood-O’s gimmick was that he literally was the bar. He didn’t serve at the bar. He was the bar. That’s not clearly visible but I also like that about it. My favourite feature is the inside cupboard. I started working on a new design right after Nood-O. 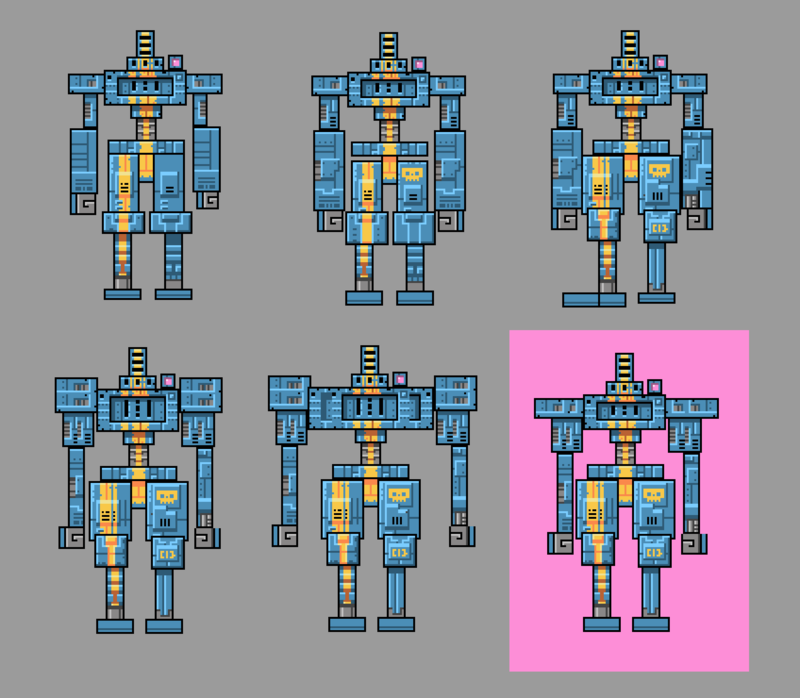 All of these robots are prototypes and with each model I try a new concept. Why do I prototype? To figure out what works best for me and eventually for future consumers. Each model answers old questions and brings up new ones. The idea behind this one was to make a robot that was simpler to assemble than its predecessors. Nood-O is my personal favourite but it was also hell to assemble with parts spread across 6 sheets of A3 paper. The self imposed limit was to design a model with as little cubes as possible. Am I happy with the result? Ehhh…Something about this model is missing. The idea of robot twins being both the vendor and the stand is cute but overall there is not much to look at and it’s lacking details like Piz-O’s rat friend and Nood-O inside cupboard. These seem like tiny details but it’s a sign of depleted creative energy. It was not for nothing though, Gelat-O is the tallest in the line and that gave me some thoughts about practicality. The designing part was fun but during cutting out the paper and the assembly something bad happened: I got bored. I’m not sure what was the cause. It might be that I just don’t like cutting and folding. I’m looking for ways to simplify that process. More about that later. Another cause might be that I just ran out of creative juice. It didn’t feel right making one so quick after the other. I’m always aware of being on autopilot. In art and design that can be a bad thing. As much as I liked the result. 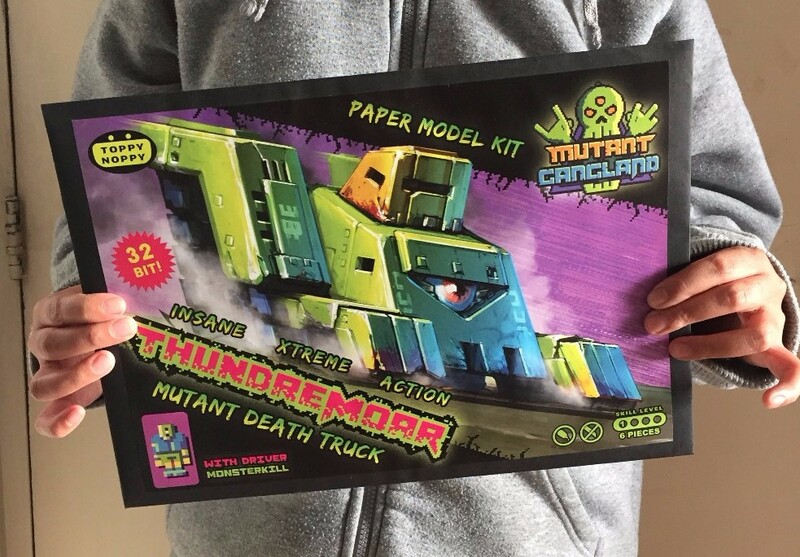 There’s not gonna be a new Munchybot for a while. The way I see it there are two places people can come across these robots: The internet and physical stores. I think the factors than can lead to a purchase vary somewhat per venue. Lately I’m pondering about what might move people to a purchase in a physical store.There are many factors in a store I cannot control. The only thing I can control is the package. So: What’s going to be on the package? What will we tell the person holding this object? I am new at this but from my point of view I’d like to know if this object was able to fit on the last sacred personal place a modern adult has in their life which is their desk (assuming people even have a desk). The larger a toy is the less places you’ll be able to fit it. So the size is a factor. All the current Munchybots are too big for that. I somehow have to come up with smaller designs. On the other hand: Who are we designing this toy for? Is it for adults like me or is it for another group? It’s good to ponder that. About that cutting. Lots of work! I’ve been scouting around for ways to skip manual cutting. There are machines that read vector files and cut custom shapes out of any paper you feed them. These things are also around $200. Let’s just bite the apple and keep manually cutting for a while until I figured out papercraft. But that’s for personal use. Most important right now is to come up with a technique that does not require cutting or glueing on the side of the consumer. 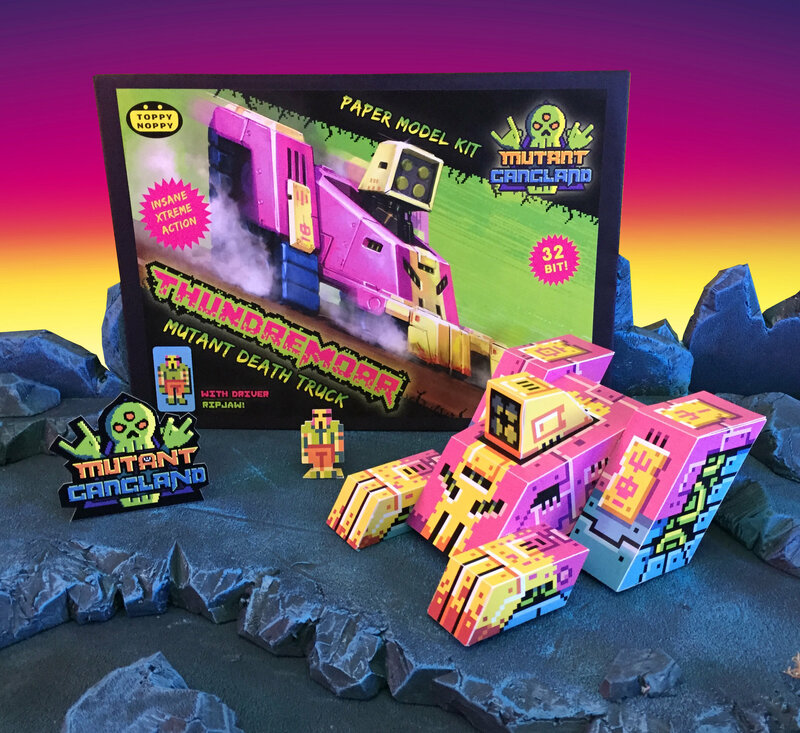 There are still so many things to address before Munchybots can go up for sale. 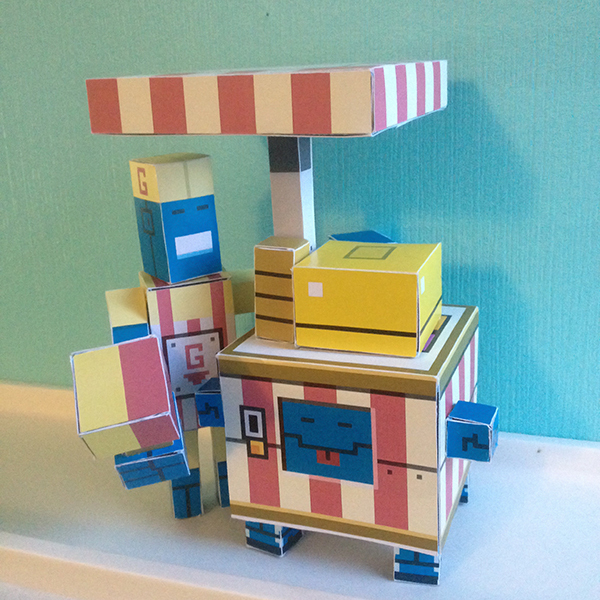 As a side-hobby from my hobby I’m putting together a new papercraft robot. 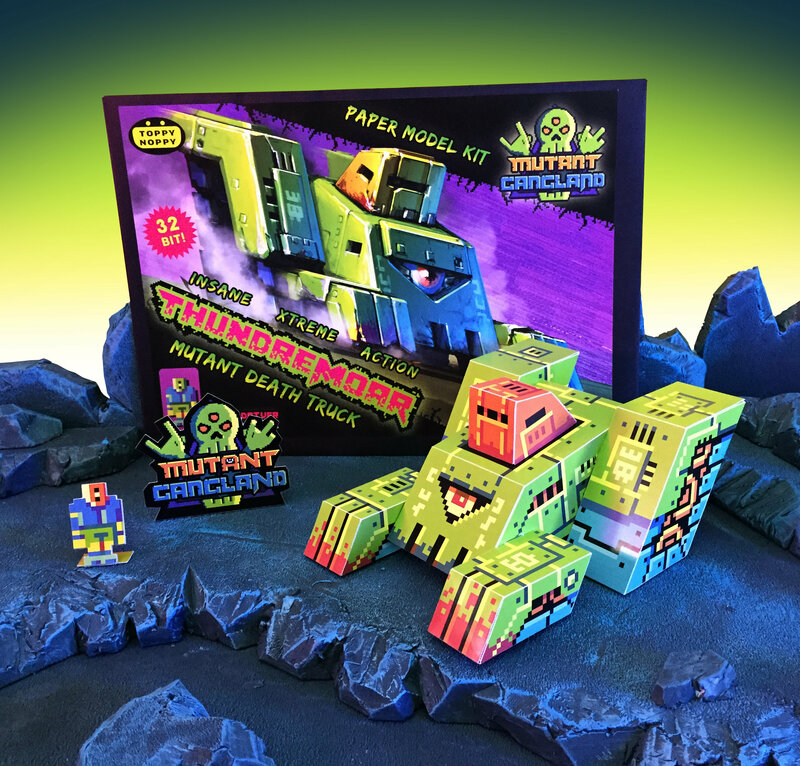 It’s not a Munchybot, It’s Signal from Mutant Gangland. That’s a place I made up from I game I worked on. A wasteland future roamed by mutants and robots. The figure has more emphasis on pixel art texture and I’m also trying black outline. Much like you see in the Borderland games. It will be hell to cut again but I’m curious to see how that outline will turn out. Concluding: I haven’t felt this productive in years but there is also caution. I know myself and I’ve dived headfirst into short-lived hobbies before. Here’s hoping maybe this time I will pull through and deliver. If you want to know how that will go then may I suggest getting into my newsletter?